Be aware of your competition! The Australian job market is more competitive than ever; when applying for jobs not only are you competing against new job seekers but you are also competing against employed people looking to change companies, be promoted or change career paths. 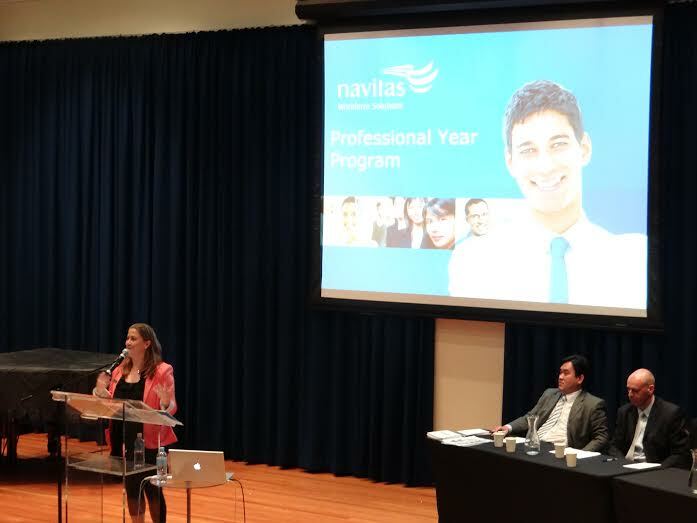 Anna McLeod, Business Development Consultant at Navitas shares. A strategic approach – You need to focus your efforts on finding the right role to apply for. 70% of your time should be on research and preparation while 30% should be on the execution of your application. It is essential to not waste your time applying for the wrong role for you. Demonstrate your motivation – avoid having gaps in your career pathway (resume). Get a part time job, if you aren’t able to have a part time job, join a student association, committee or engage in volunteer work for a not-for-profit organisation. These types of activities show an employer that you are a motivated, hardworking and pro-active young professional. Learn from those around you – You will know classmates, friends or family members that have been successful at starting their career. Don’t be afraid to ask them what made them successful. They may be able to provide you with the one piece of advice you are missing from your strategy. How Broad is Your Network? In my experience recruiting staff, I feel more confident hiring someone I know or someone that has been recommended to me by friends or colleagues. This is because I will know in advance what their personality and work ethic is like and whether or not this matches the existing team environment. Feedback I have received from senior managers across a range of industries indicates that this is very typical of recruitment practices in Australian companies. So the question becomes, how do you get to know more people who can recommend or hire you? The answer is networking. People often make the mistake of not networking at all or not recognising that networking is more than just going to an industry event. Networking happens in many settings and different ways. Some examples include: attending conferences, volunteering, Facebook, internships, joining a committee, contributing to open source projects, casual and part time work and LinkedIn. Given the growth, reach and professional focus of LinkedIn, it is the place to be for graduates and professionals who are serious about their career. Recruiters have confessed that they actively use social media when searching for suitable candidates. It is like a brochure of potential employees that recruiters can easily search through rather than having to advertise and sift through masses of unsuitable applications. Recently I have received a lot of feedback from both recent graduates and seasoned professionals stating that recruiters have approached them via LinkedIn about job opportunities. Use key words effectively in your sub heading and skills sections; this will enable you to be found by recruiters and employers searching for staff. Join groups related to your industry, this will help you expand your network. It will also enable you to connect with people you don’t know. Use the publications and links tools to show samples of you your work; this is a great way to highlight your skills. Recommendations – don’t be afraid to ask for recommendations from supervisors, colleagues and business connections. A good way to get a recommendation is to give a recommendation! If you are going to have a LinkedIn profile, make sure it is a complete and good quality profile. A half completed profile can do more damage to your job seeking than you realise. Be thoughtful about your interactions – this is not Facebook. Your status updates should be in line with the brand you are trying to portray. You should tailor your invitations to connect, don’t simply use the default message set by LinkedIn. Don’t oversell your skills and experience on LinkedIn as you will be questioned on these at interview. In closing, your success will be proportional to your efforts – the more channels you utilise to get exposure to prospective employers the better. Anna is a Business Development Consultant at Navitas, a leading global education provider of a range of educational services.